Aloha! A while ago I've received the sweetest little package all the way from Honolulu, Hawaii. As I mentioned some time before, it's so exciting for me to receive something from such far away, exotic places. It's just a totally different feeling from just buying from the local stores. Do you know what I mean? Or maybe it's just my wanderlust talking for me! Anyway, the package contained three gorgeous necklaces. 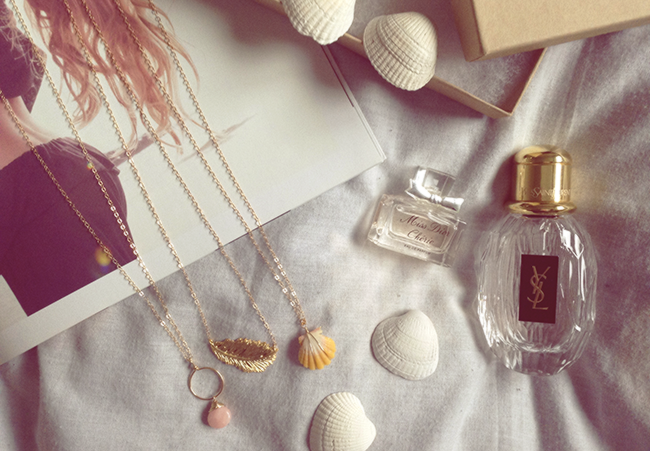 Gold, delicate, dainty and so mermaid like! Fun fact about the naturally colored scallop shell - they are endemic to Hawaii, and are found by divers at depths of over 30 meters - only empty shells are collected. So exciting! I also like that the necklaces are gold filled - the color doesn't wear off even if I bathe with them and yet they are really affordable. Check out SUNLACES for more Hawaiian treasures. I'm in love with the store! I love dainty gold jewelry like this -- so easy to wear. the pictures on your blog are always so perfect! Don't miss out the new post on my blog!! Lovely items and pictures ! What beautiful pieces! I totally love them - the feather one especially. It's so gorgeous. wow these items are so gorgeous! 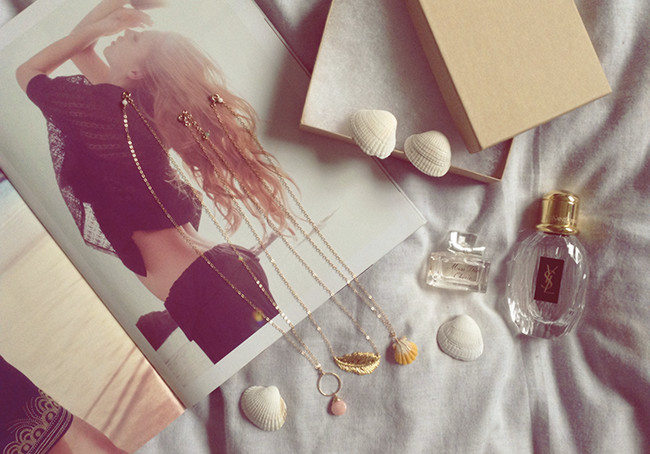 Those necklaces are so delicate and beautiful - love them!! Makes me want to go back to Hawaii really bad! Thanks for visiting my blog, yours is gorgeous! I love that parisienne scent. Its sooo nice. Ooo I love these shells! beautifull necklace! 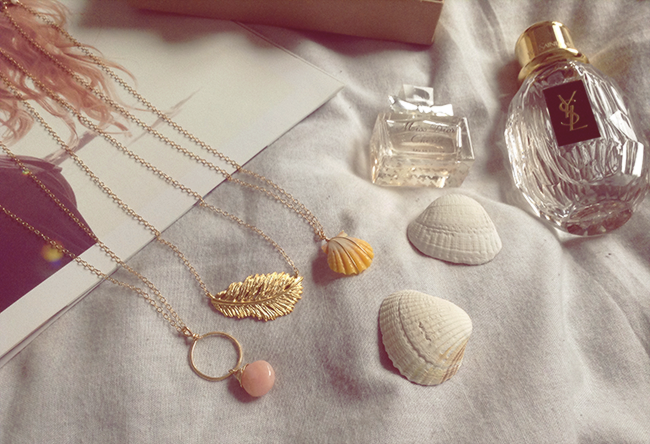 !love the shell one! 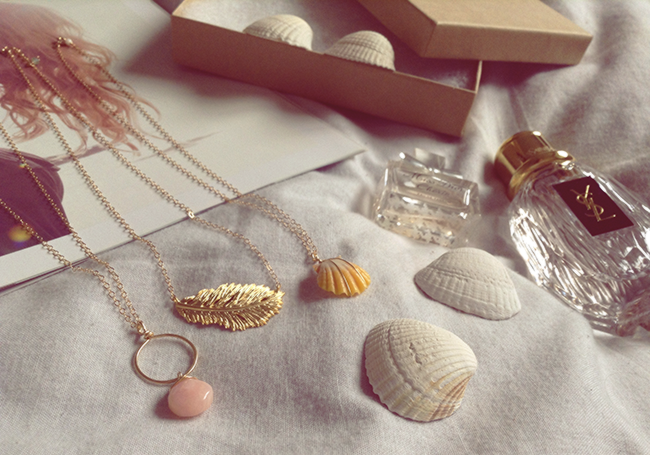 The necklaces are so pretty, especially the shell one. And the photos are so beautiful and perfect! gosh ! how i really want the ysl perfume ! Lovely necklaces, I'll deffo check their store. Cute pics! Love those necklaces!!! Love the way you shot the necklaces, very pretty!! :) Looking forward to future posts! Me ha fascinado el colgante con la conchita!!!! Oh my! I'm in love. wow your blog is so inspirational...I really have enjoyed my visit here. I love the jewelry! <3 So dainty and delicate. I actually have that photo on my inspiration wall, looks really cute with the necklaces in these photos. Stunning photos, I love all of your delicate jewellery pieces! I love your creativity when you take photos . This post is absolutely gorgoeus. It looks so serene and I am loving the beautiful jewlery. I am officially following your beautiful blog :) GFC #2117 . Hope you can check out my blog and possibly add me .